'Threkshitiz' is an organization active in the field of trekking since past 15 years. The organization has consistently carried out activities in the areas like trekking, documentation of forts as well as fort conservation. The group’s websitewww.trekshitiz.com with its exhaustive database is already a benchmark and is being used frequently by trekkers as a source of reliable information. Besides, the organization regularly arranges events like exhibitions of photography, exhibitions of fort modelling, series of lectures as well as treks in the Sahyadris. Taking this further, Prasad Nikte – one of our group members – has planned an expedition in the mountain ranges of the Satpuda and the Sahyadris. An expedition to traverse the entire edge of the Deccan plateau on foot – “Walking on the Edge”. We believe, this expedition will prove to be a new chapter in the organization’s history. The expedition will start from village Bharad located on the banks of river Narmada in theSatpuda mountain range, where borders of Maharashtra, Gujarat and Madhya Pradesh meet. And it will finish at Chorle Ghat, which is the tri-point of borders of Maharashtra, Goa and Karnataka. This 60-day expedition is going to start on 25th of March, 2017 and will last till end of May. 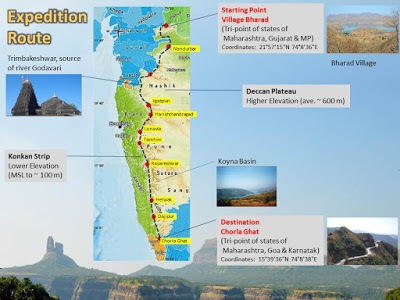 Aim of the expedition is to walk along the edge of the Deccan plateau. However, a detour will be necessary in certain sections like the Koynaforest reserve. Apart from such regions the route will run along the edge of the plateau. The expedition will be carried out solo by Prasad Nikte. But where necessary from safety perspective, either a local guide, other members of the Trekshitiz organization or fellow trekker will accompany him. Apart from the thrill and joy of a cross-country trek in the wilderness, this expedition also aims at observing and documenting the life, culture, dialects as well as traditions and deities of people living along the route. 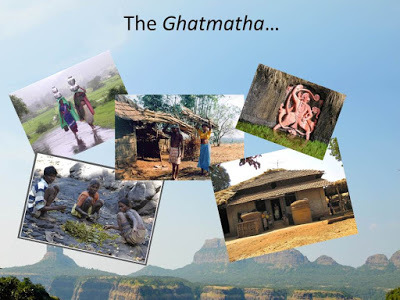 Wherever possible audio-visual means will be used for this purpose, which can result in a valuable documentation on present-day social life in Satpuda and Sahyadri mountain ranges. Experts in various related fields have provided their guidance in planning this expedition. Enormous efforts are also put in by Ashwamedh Pratishthan - an organization active in Murbad and surrounding areas – which carries out multiple campaigns related to environment, fort conservation and social development. Twice in the past Ashwamedh Pratishthan has conducted bicycle rallies in the Sahyadris. The recently executed bicycle rally - spanning over 1200 km from Navapur to Sawantwadi and the one which brought together many organizations active in the Sahyadris – is a milestone along Ashwamedh Pratishthan’s path of progress. Valuable support in organizing and planning the expedition is also being provided by members of Offbeat Sahyadri.